OAKLAND — This game had all the makings of a blowout — until the Clippers launched one of the most impressive, and simultaneously shocking, runs in recent history. They overcame a 31-point second-half deficit to beat the Warriors, 135-131, evening the series at one game apiece. Before Monday’s game, Doc Rivers called the Warriors a “spurt team.” He went on to say the Clippers expect those spurts will come, but limiting them, and responding with runs of their own, is very important. One of the biggest things to watch in this series is the margin in which the Warriors lead when the Clippers’ super-subs check in. Their best players — as Steve Kerr has proclaimed — do not start: Lou Williams and Montrezl Harrell. Rivers prefers bringing them off the bench for their energy and their synergy with one another. And he’s right — Los Angeles’ most effective offense in two games has featured Williams and Harrell in a pick and roll. The Warriors withstood this very well for the first half, then very poorly in the second. Williams looked to facilitate in the early going, but his jumpers didn’t fall. He went 0-3 in the first half with all five of his points coming on free throws. The Warriors outscored the Clippers by two points by the time Kevin Durant checked back into the game at the 8:42 mark in the second quarter. They beat the Clippers by three points with Stephen Curry and Draymond Green sitting the first 5:41 of the second quarter. The Warriors bench’s ability to keep pace with starting units has been a hallmark of all of their championship-winning teams, and that manifested again in the first half Monday. Curry and Green entered the game with the Warriors leading, 50-39. Fast forward to halftime, and they extended that lead to 77-53. The nuclear power of the Warriors’ starting five proved to be greater than that of Los Angeles’ standout bench unit in the first half. Curry went on one of his vintage mini-runs that put the game out of the Clippers’ grasp 24 minutes in. In the final 2:43 of the first half, he poured in 11 points. He finished with a team-high 29 points Monday. The Warriors benefited from a dominant first half, but the Clippers, in stunning fashion, responded with a better second. They slowly overcame a 31-point deficit and needed every minute in the game to complete the comeback. They cut the deficit to 11 points with 11 minutes left, which proved to be enough time. The game’s trajectory changed when Curry picked up his fourth foul fewer than four minutes into the third quarter. At that point, the Warriors led by 28 points. The next time he checked in, that lead was cut to 17, and the comeback was on. Behind Williams and Harrell, the Clippers cut the Warriors’ lead to two points with three minutes remaining. A Durant dunk, plus a free throw, extended the lead to five, but the Clippers refused to go away. Harrell responded with a dunk on a pass from Williams. WIlliams followed with a free throw and a tough jumper over Klay Thompson on the following possession to tie the game. Curry made a three that felt like the dagger, but Williams responded, again. The Warriors did not score another point. 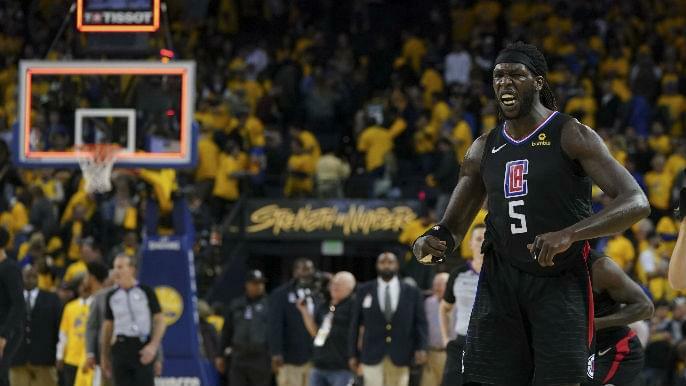 On the next Clippers possession, rookie guard Landry Shamet hit a three, the Clippers got a stop on the other end, and Harrell sunk two free throws to seal the win. The most important breakthrough Monday night had nothing to do with the basketball. Three-and-a-half minutes into the game, Cousins chased down a loose ball near the Warriors bench. He collapsed, writhed in pain as he held his left thigh, and made his way to the Warriors locker room upon realizing he couldn’t re-enter the game. The immediate reaction didn’t exude much optimism — and neither has the initial report. According to ESPN’s Adrian Wojnarowski, the Warriors fear Cousins suffered a torn left quad. If that’s the case, Cousins is almost certainly out until the NBA Finals. The recovery period is generally about six weeks, at a minimum. Losing Cousins is obviously a major blow to the Warriors, who have never had an all-world offensive talent at center during their current five-year run. There is a massive talent disparity in this series. If the Clippers hope to win, they need Williams, their best player and likely Sixth Man of the Year, to take over stretches of the game. Williams was uncharacteristically quiet in the first half Monday night. But he was simply the best player on the floor in the second half, pouring in 31 points and leading Los Angeles to an all-time comeback. Williams fueled a 44-point third quarter to cut Golden State’s lead to 14 entering the fourth. He exploited a suddenly disconnected Warriors defense, taking over the game with impressive shot-making and flawless pick-and-roll execution. He continued that in the fourth quarter, as the Clippers poured in another 41 points. Williams not only led the comeback, he single-handedly withstood the Warriors’ late blows. After Durant made the dunk and free throw to extend the Golden State lead to five with two minutes left, Williams found Harrell for a dunk. After Curry made a three to give the Warriors a three-point lead, Williams responded with a highly difficult jumper over Thompson. When Williams scores a lot, the Clippers typically win. Of his 12 highest single-game point totals of the season, the Clippers won 11 of those games. He scored his fourth-most points in a game this season, with 36, on Monday. The result? A dramatic four-point win to even the series at one game apiece heading to Los Angeles. Best two-game stretch of Looney’s career? From a Game 1 filled with endless Curry highlights and Durant’s and Beverley’s dual ejection, Looney’s six-point, five-rebound performance probably won’t be remembered. But he owned arguably the most impressive statistic — he was plus-30, meaning Golden State led by 30 points in the 17 minutes he played. Looney did all of the little things that make him such an invaluable member of the Warriors. He set solid screens for Curry, who took advantage of the open air space. He showed no issue detaching to a guard defensively and staying with him throughout the play, which is nothing new. He caught and finished dumpoffs. He even made a couple impressive mini-fadeaways. Looney continued all of that in Game 2, while upping his offensive presence. He went 6-6 from the floor and 7-8 from the line for 19 points. He made a handful of layups that didn’t seem to be open until he used his body to gain a slither of separation. Looney’s breakthrough comes at the right time, as Cousins’ availability hangs precariously. Perhaps the only team-wide negative from Golden State’s 17-point win in Game 1 was the 21 turnovers. Taking better care of the ball has been a longstanding emphasis, and that message was reiterated among the team entering Game 2. The Warriors followed through on that focus — for about a half. Then, the bad habits resurfaced. At the end of the first half, they had six turnovers, on pace for fewer than their season average of 14.3 per game. But the Warriors turned the ball over 16 times in the second half, which gave the Clippers the extra possessions they needed. The Clippers put up 85 points in the second half to extinguish a massive deficit, all because Golden State got sloppy. The only consistent flaw among these Warriors is that, sometimes, they get too carefree. Maybe it’s human nature, considering they are much more talented than the next-most talented NBA team. But preserving the ball will continue to be an emphasis throughout this series and into the future ones featuring more dangerous opponents. Because they won’t want to relive an epic collapse like the one we saw Monday.